Las Vegas Shows have this unique aspect, this spectacle that is impossible to find elsewhere. It's a fresh experience first-timers. Nowhere else do show owners take such a large budget and put it so prominently on display. You'll find yourself intrigued by some prop that must have cost $15,000, and wonder when you'll see it again in the show, only to realize that yes, it was only meant to be displayed for thirty seconds. Other theater owners only dream about the kind of resources available to Las Vegas show producers. Sure, in Los Angeles, you can visit a show that's on the cutting edge of experimental theater. And in New York, you can go to Broadway to see great shows the way they've always been done. But only in Las Vegas can you see a spectacular, one of a kind show, performed by the top artists in the world, in the theater built for that show. Where else will you be able to sit in a showroom outfitted with 6,341 speakers, three of which are embedded in your seats? Where else will you watch actor/gymnast/miracle workers dance on a stage that shifts and transforms constantly? Where else will you see the music of the Beatles get treated so well? Las Vegas Shows have become the centerpiece for so many tourist visits from around the world. We're famous! My rule of thumb for shows/prices in Las Vegas is: If a show costs $30, it will be worth $30. If a show costs $170, it will be worth $170. Theater is very competitive here, and inspiration for performers is around every corner, so every performance is the equal of its ticket price. The cheap shows, those costing around $20, will almost always give audience members their money's worth, and the same goes for the more expensive shows. The exceptions to this rule are the free shows. The Treasure Island Sirens, the Bellagio Fountains, the Show in the Sky, and even Fat Elvis at Buffalo Bills will all provide much more entertainment value than expected. Many different genres of show have found success and spawned copies in Las Vegas. 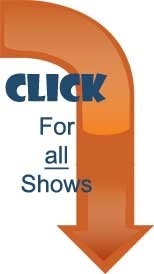 We've got Adult Shows, Hypnotists, Big Productions, Cirque Du Soleil, Live Concerts, Comedians, Magicians , great Tribute Shows, and plenty of offerings for Families. Get your Las Vegas show tickets right here. We've scoured the country for great ticket brokers to partner with. We're proud to be able to offer the most sought-after show tickets for very cheap prices, and we post every discount, promotion, and deal as soon as we see it. We want you to save money, because we think no trip to Las Vegas is complete without at least one show, and two are even better. Take care of those logistics right now. The shows should be at the center of your things-to-see list. With the show times locked in, you'll find the rest of your days on The Strip much easier to organize and plan. Check below for all the shows worth seeing in Las Vegas.